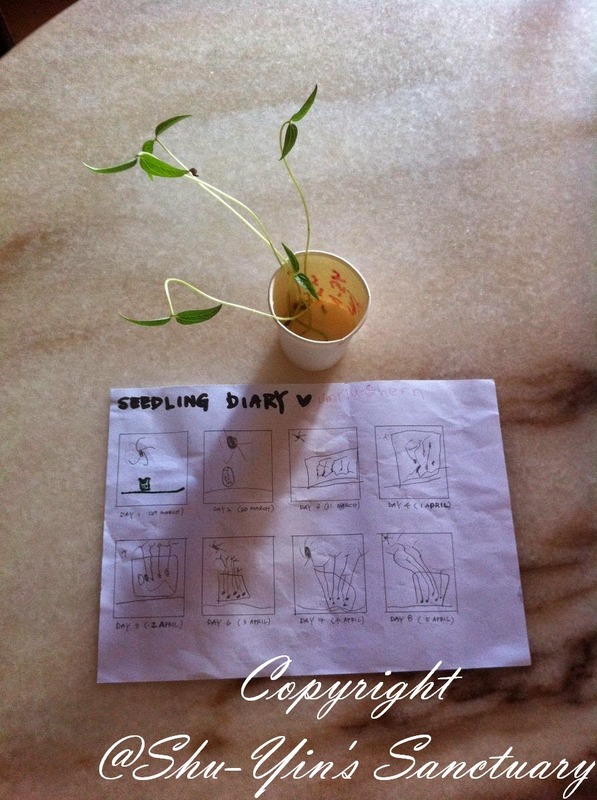 Earlier this month, Shern came back from his Drama Class with a paper cup and 5 little seeds in it and some damp cotton wool. 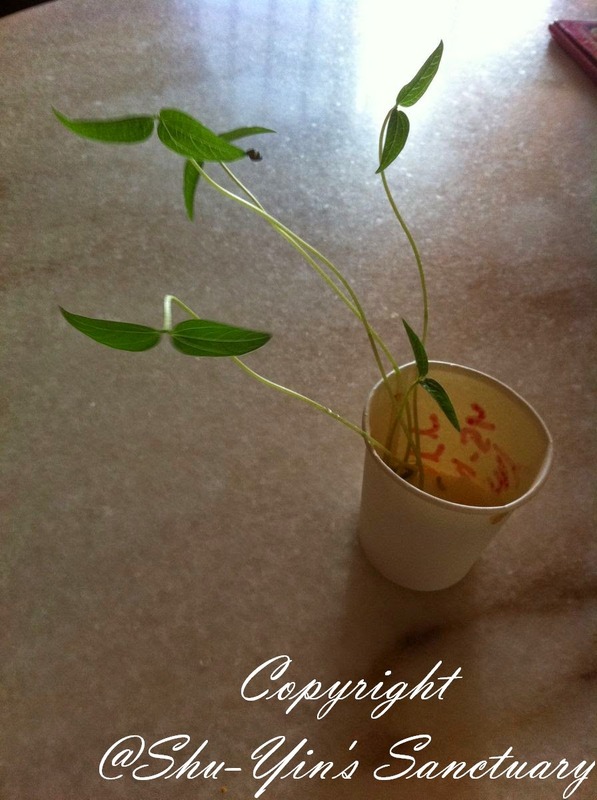 I knew immediately they are bean sprout seedlings. I think everybody in Malaysia has done this thingy while we were kids in school, right? He got pretty excited and told me that he needs to bring it home and put it in a place where there is sunshine and also to water it every day. "Just a little water, not too much water ok" said Shern. 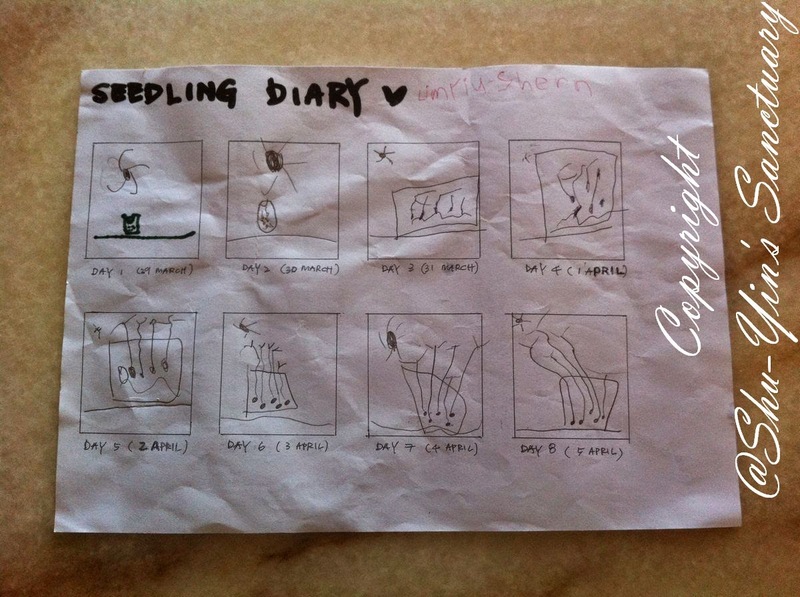 And he also brought back a piece of paper in which he needs to update his Seedling Diary everyday. 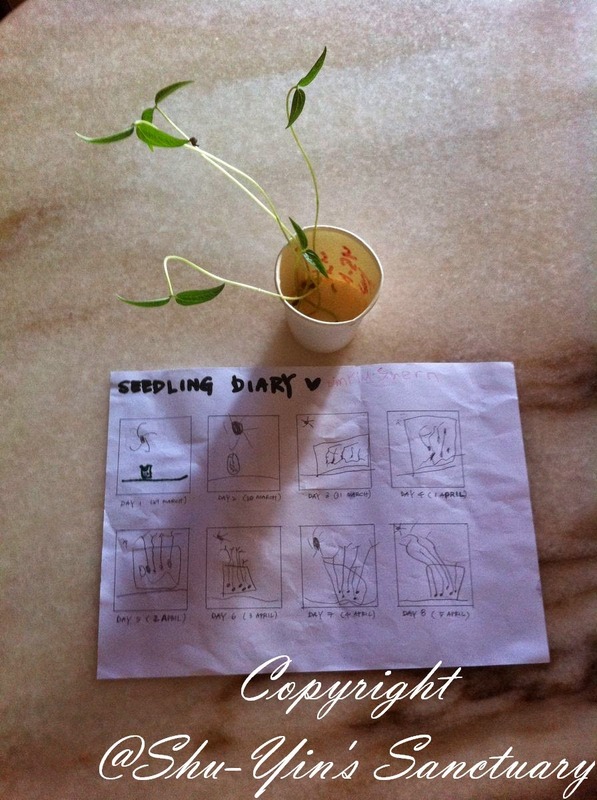 He would need to draw the progress of his seedling. So every day, he would jot water his seedling, and then he would look at his seedling and tried to draw it on the squares according to the dates. After 8 days, this was what he drew. I found it really interesting upon seeing his drawings. I found that I looked at the seedling through his eyes. He drew a sun on every square. And somehow he drew a line on every square before he drew a square (for the cup). I think he drew that because we always brought the cup to the table for him to see and draw, so I supposed the line was meant to be the table. And he meticulously always drew five black dots to indicate his five seedlings. 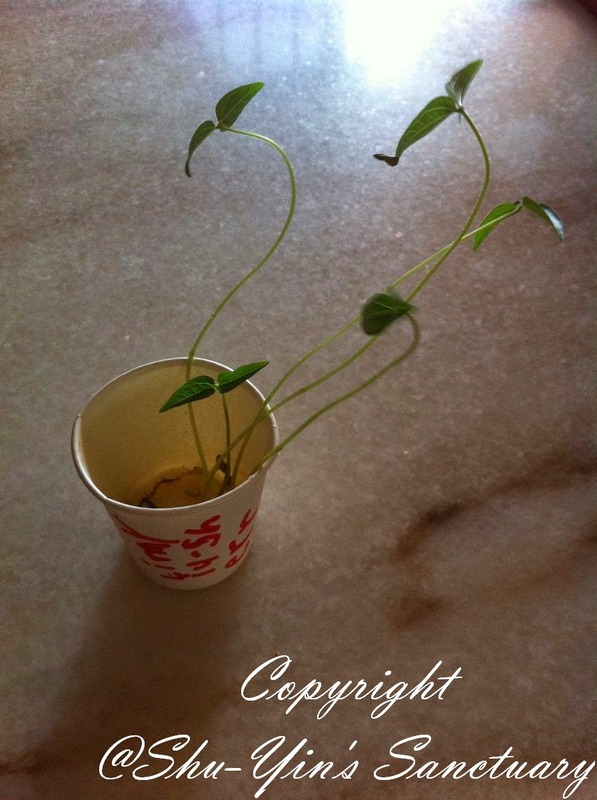 And if you noticed, not only his seedlings grew bigger, but his cup got bigger too. haha. being responsible for his own plant. He knew if he didn't water it or take care of it, it would die. what a plant needs to survive. He learned that a plant needs oxygen, water and sunlight to survive and grow big and tall. He also learned about being patient, as you can't just make a plant grow big the moment you water it. It takes time. He learned that this is where food (vegetable) comes from. So this was a life lesson well learned. Such a clever idea! I might borrow this to do with my own kids as well. 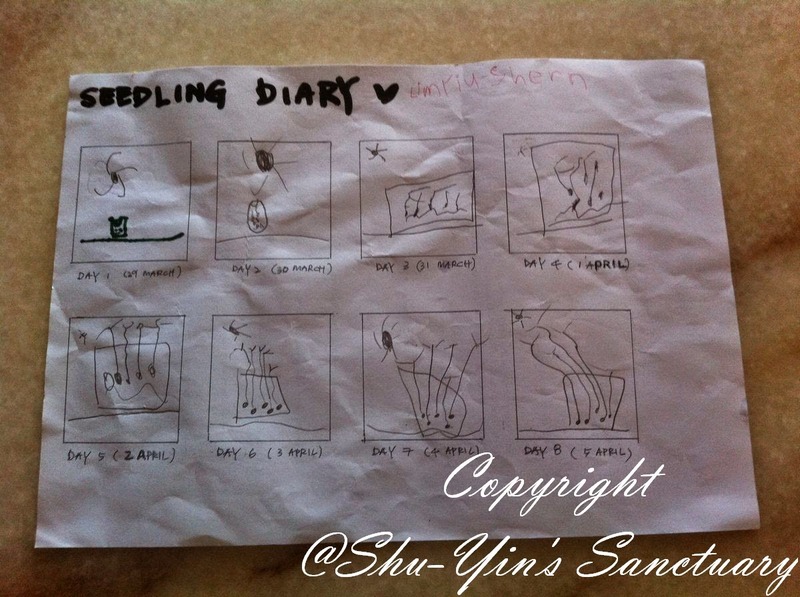 And good job Shern on documenting the whole process so well!